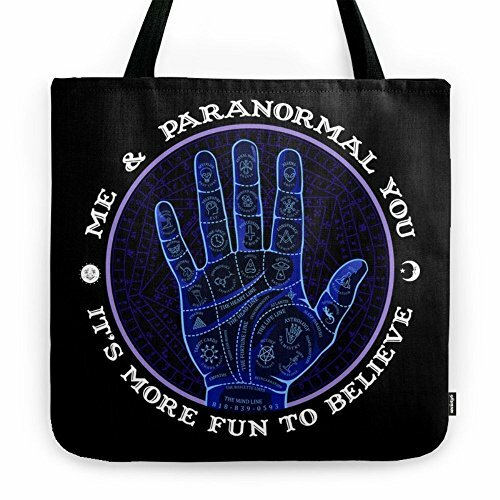 Society6 Me & Paranormal You - James Roper Design - Palmistry (white Lettering) Tote Bag 18" x 18"
Society6 Me & Paranormal You - James Roper Design - Palmistry (white Lettering) Tote Bag 18" x 18" by Me & Paranormal You. Our quality crafted Tote Bags are hand sewn in America using durable, yet lightweight, poly poplin fabric. All seams and stress points are double stitched for durability. Available in 13" x 13", 16" x 16" and 18" x 18" variations, the tote bags are washable, feature original artwork on both sides and a sturdy 1" wide cotton webbing strap for comfortably carrying over your shoulder. Our quality crafted Tote Bags are hand sewn in America using durable, yet lightweight, poly poplin fabric. They are washable, feature original artwork on both sides and a sturdy 1" wide cotton webbing strap for comfortably carrying over your shoulder. An independent artist profits from every purchase with Society6. If you have any questions about this product by Society6, contact us by completing and submitting the form below. If you are looking for a specif part number, please include it with your message.